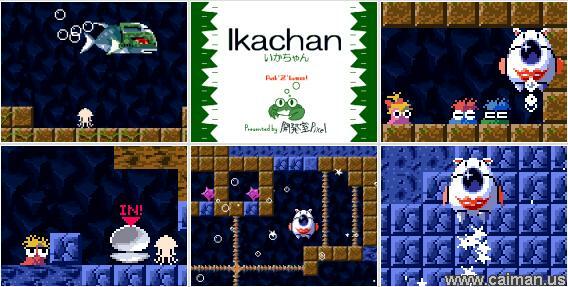 Caiman free games: Ikachan by Pixel. 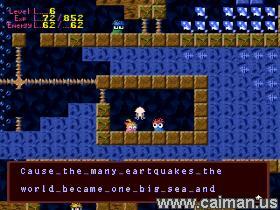 Control Johnnie, a little squid and try to save the underwater world. Cause many earthquakes the place where our squid lives became isolated of the big sea. At this manner there is a food-shortage. Your task is to rescue the inhabitants. This adventure take place in one big level. 1. Iron Head: the enemy, a big fish with an iron mask. There are 3 oysters spread over the playfield. Go inside suchs an oyster to sleep (restore your health) and to save to game. 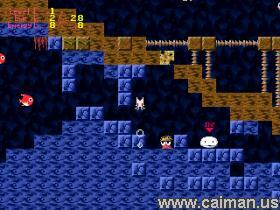 There are several items to find and you will also get some items from the other inhabitants. You start with a weak squid (level 0). Through eating food packets and ramming fishes and crabs, you will earn energy points. Each time you reach a certain number of points you will advance to a higher energy level. A trick: If you killed all the fishes and crabs and you want them back so that you can kill them again for more energy points, just go inside an oyster (sleep+save game) and all the fishes will be back. There are only 3 keys for stearing your squid. The left and right arrow keys and the Z key. The manner of stearing lets me think on the classic moon lander games. If you press the Z key, your squid will go upwards, but if you release the key, it will fall downloads. When the game want to ask you something, you will see the next on the screen, it just means "yes" and "no". Select one of both (arrow keys) and press the Z key. I translated the whole game from Japanese into English. So the caiman.us download contains an English version of this game. It was a very big task to do that and the result is not very good, but I think the game is now easier to play if you don't understand Japanese. The original Japanese text files are included in the download. So, if you wish to play it in Japanese, just rename them. If you want to improve the "english" conversations look at the Event.ptx file with a text editor as Notepad or so (do not use Word). 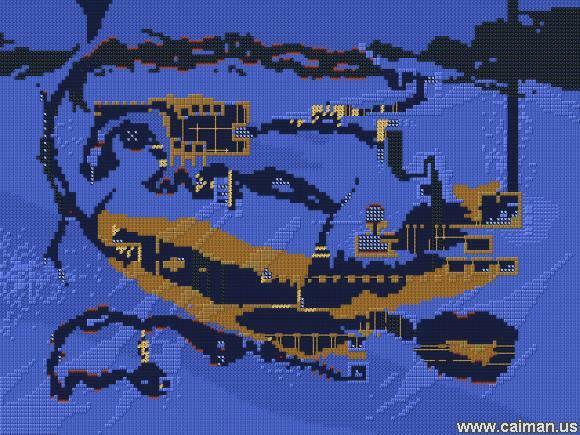 To help you more, here the complete map of this game. I assembled it by using more than 100 screenshots. The size of the download is only 158 kB and still this game is big, has great graphics and good music and sound! I completed this game more than once and I can tell you that this is one of my favorite games!